While the desire to not rely on the world’s forests for building demands is well-intentioned, the advantages of wood as a building material still outweigh other products on the market when looking at the environmental impact and performance. Tensile strength – For being a relatively lightweight building material, wood outperforms even steel when it comes to breaking length (or self-support length). Simply put, it can support its own weight better, which allows for larger spaces and fewer necessary supports in some building designs. Electrical and heat resistance – Wood has a natural resistance to electrical conduction when dried to standard moisture content (MC) levels, usually between 7%-12% for most wood species. (This conductivity is, in fact, the basis for one type of moisture measurement system.) Its strength and dimensions are also not significantly affected by heat, providing stability to the finished building and even safety implications for certain fire situations. Sound absorption – Wood’s acoustic properties make it ideal for minimizing echo in living or office spaces. Wood absorbs sound, rather than reflecting or amplifying it, and can help significantly reduce noise levels for additional comfort. 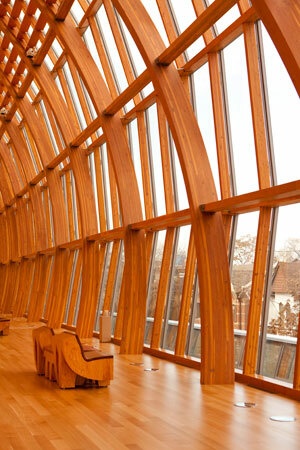 Beauty – With the wide variety of species available, wood presents an incredible range of aesthetic options, as well as provides varied mechanical, acoustic, thermal properties along with others that can be selected based on the need of the building project. At a time when ecological concerns are high, the trend has been to move away from wood as a building material in order to prevent deforestation, in part as an attempt to manage greenhouse gasses. However, a closer look at the reasons for this thinking can prove to be slightly off track. 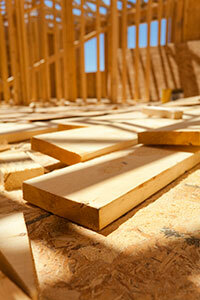 Wood has several advantages that help both the builder and the environment. While the forests are growing (via solar energy), they are also naturally and efficiently removing carbon dioxide from the environment. It’s a bonus unique to wood. When compared to building materials like steel or concrete, the life cycle of wood has a lower overall impact on the environment than its counterparts and as a result also costs significantly less to produce. Wastewater production and environmental impact are also significantly lower in wood manufacturing processes, particularly when compared to steel. Many lumber mills use wood byproducts (chips, bark, etc.) as bio-fuel for their facilities to reduce the fossil fuel burden of the production process, and moisture measurement systems like Wagner Meters’ Moisture Management and Grade Recovery Program allow mills to maximize efficiency and produce less sub-grade and waste materials in the drying process. As forest management and replanting programs continue to grow, these benefits are continually multiplied. As a natural building material, wood emits significantly lower volatile organic compounds (VOCs) and carbon dioxide off-gasses than aluminum, steel, concrete and plastics. This is not, however, necessarily true of engineered wood products or composite wood products. Wood’s lower VOC impact is of particular benefit to homes and offices that are occupied on a daily basis. In fact, one of the things wood does give off is a natural organic compound that relaxes people–it’s not just the warmth of wood’s color that creates such an inviting effect. One of the biggest challenges of many building materials, including concrete, metal, and plastics, is that when they are discarded, they take an impossibly long time to decompose. When exposed to natural climate conditions, wood will break down much more quickly and actually replenish the soil in the process. On the flip side, understanding the role of moisture and wood rot means that when conditions for the wood are optimized, the lifespan of the building or floor can easily outlive the lifespan of the tree! One of the most important elements when maximizing wood’s performance over time is having an accurate understanding of wood’s interaction with moisture. The first step in preventing moisture-related damage in wood floors and other wood-based building materials is in bringing each wood building product to the correct MC level. This process begins at the sawmill kilns and carries on through to each finished building application. At each step, it’s necessary for accurate MC measurement to determine the wood’s final performance. Why the Focus on MC? Wood is a hygroscopic material. It naturally has a give and take relationship with the humidity in the air around it and is always in the process of trying to find a balance between its internal MC and the ambient conditions around it. On the job site, wood needs to be in balance with its environment, a state referred to as equilibrium moisture content, or EMC. If builders or flooring installers begin the project before wood has adjusted to the relative humidity levels around it, they run the risk of the wood warping, twisting, splitting, or having significant gaps or buckling. The right tool for monitoring wood MC is a wood moisture meter. Pin-style moisture meters work in conjunction with the electrical resistance properties of wood by measuring a precise area between the tips of two metal probes or “pins” inserted into the wood. Pinless moisture meters have the advantage of measuring MC along an entire length of a board without causing repeated damage to the wood’s surface. 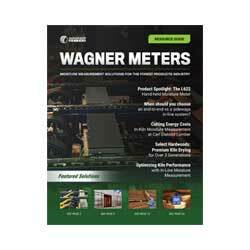 Here at Wagner Meters, our pinless moisture meters are designed with IntelliSense™ Technology, which means MC readings are not susceptible to surface moisture or temperature, and can “scan” wood for MC at a uniform depth without surface damage. The meters provide easy-to-use, accurate MC measurement to be sure that every building and flooring professional knows the MC of the wood they will be using in the building process. Overall, wood has some “built-in” advantages when choosing a material with both environmental and aesthetic appeal, and with the right application of wood MC management, wood can retain those properties for generations. Finding a lumber mill that will maximize efficiency and produce less sub-grade waste materials in the drying process is a great idea. A company that knows what they’re doing and has the skills and equipment they need could help you get the best quality. Making sure you have the best building materials could help your project work better and last longer. Wood sounds like a fantastic building material. I love the fact that it’s renewable, so, as long as we’re careful, we’ll naturally have enough wood forever! In my opinion, natural choices are almost always better than man made ones. I didn’t realize that moisture could play such an important role in ensuring that the wood you use in your house is strong enough to support everything. It does make sense that moist wood could end up being a little bit weaker because it would allow the fibers to bend or even break. Having building supplies that are up to par with health codes and things like that would be pretty important. Thanks for elaborating on the benefits of using lumber when building. I never really thought about the idea that wood actually absorbs sound and can reduce noise levels. I would imagine that wood can last longer than a lot of other materials if you treat it right as well.